Year in and year out, Californians have become accustomed to the man in the snow. 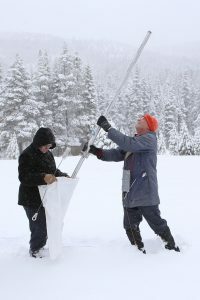 Frank Gehrke has walked through a Sierra meadow during the past 30 years to educate the public about the snow pack. Now, he is retiring. Click here to read more. UCLA Scientist Dr. Bin Guan is the Department of Water Resources (DWR) 2018 Climate Science Service Award honoree for his tool that identifies atmospheric rivers in weather models. Click on here to read more.